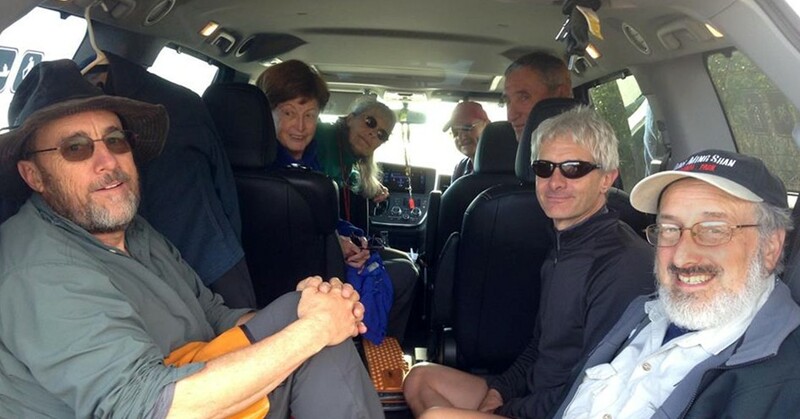 Sara shoots all seven drivers in her van before running the shuttle: John Walton, Barb, Jocelyn, John Willis, Henry, Kurt Reinhart, and Harold. At the put-in: Angie & John Willus, John Walton, Sara, Barb & Mike, Henry, Steve, Kurt Reinhart, and Harold front and center. Pam is already on the river, and Jocelyn is behind the camera. I've wondered for ages what those tall rosy maroon seed heads were. Angie says "Dock," which comes in several varieties. John Walton and Sara in the distance in the slow section before Deadstream and the lake. New member Kurt Reinhart at Deadstream take-out with his high performance sit-on-top which I dub "The Platapus"!